Although I regained a bit of equilibrium at the beginning of April, by the end of the month my schedule was impacted again because I was spending a lot of time looking for work or worrying about lack of work. On the positive side, I did find a job, so that is a concern that I won’t have to worry about for the next little while. Of course, I’m writing this update a bit late. I’m getting in just under the wire before May ends. And I’ve got May’s update more closely in mind than April’s update. Note to self: Do your updates earlier in the month! Time spent on writing continues to grow. Yay! 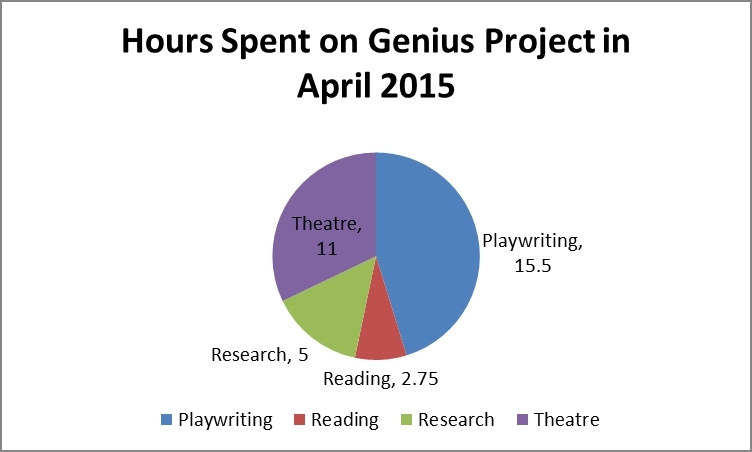 Overall, I spent 34.25 hours on the Genius Project this month. I have now spent a total of 719.25 hours on this project. Only 9,280.75 hours to go!